As a seasoned pro makeup artist with my own company ( MB Face Design ) I’m aways thrilled to meet and work with other talented artists. In my opinion it’s really important to work together as a community of artists to network, learn from and support one another, as well as build a strong respect for each other in the beauty/fashion industry! I’ve had the pleasure to meet this lovely and talented makeup artist in DC and I find her to be very creative, dynamic, warm, and bubbly! She’s all about glam and is up to date on what’s trending now in makeup and fashion! What I personally LOVE about Beta is her creative spirit and how she projects that with her ability to transform herself with wigs, contact lenses, and never ending makeup style changes! Beta Golchin is an IT Project Manager who decided to pursue her passion and hobby in makeup artistry by setting up Glam'N'Go! Glam ‘N’ Go is a social media platform created to help busy women have a site where they can go to learn how to glam up like a pro, with tips and techniques. It’s also a forum for other beauty/fashion professionals to share their expertise! Beta is a visionary and with her technology background plans on developing Glam’N’Go into a unique business venture that will help busy women in the DC metro area glam up on the go! Beta Golchin has worked with a handful of photographers on fashion and corporate photo shoots, as well as fashion shows and bridal makeovers. 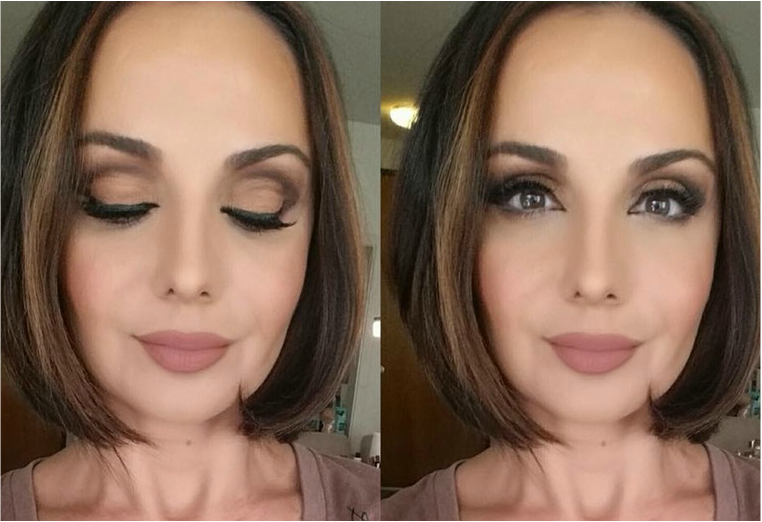 She is also very familiar with the application of airbrush makeup techniques, which she often uses on most of her clients. Beta is combining her unique style of makeup artistry with Information Technology to provide a unique makeup experience, customized for each individual client, while creating a platform for beauty bloggers and makeup enthusiasts to share, inspire, learn, teach and explore makeup. ​Marta: Where did you grow up? Beta: I grew up in Dubai, United Arab Emirates in a Persian household. My earliest childhood memory, related to beauty, was “begging” my mom to try out her homemade facial mask at the spa and health club where we had been members. I remember her making almond, milk and lemon balls and freezing them and then watched her apply them at the spa. All my female relatives growing up were always beauty conscious and I learned how to take care of my skin and health at a very early age! My high school best friend taught me how to apply makeup when I was only 14 years old! I was obsessed with beauty magazines growing up, always looking at the different makeup styles and trying to recreate them on myself! Marta: What inspired you to get into the field of makeup artistry? Beta: I’ve always loved beauty and makeup since I was a young teenager!! I was always experimenting with all kinds of makeup all the time! I was even given a contour kit back in the late 80’s from a relative who was a distributor for a makeup brand at the time. At first I thought the different shades were bronzers for different colored skin tones but then after playing around with it long enough, I figured out how to use it on myself. I loved art and makeup was an art form for me. I loved playing with shadows on my face. Even though makeup was my passion I never thought to pursue it as a career until a few years ago when I finally got on Instagram and started noticing the world of beauty more professionally! I’ve always loved giving my relatives and close friends makeovers before we went out, or on lazy days when I was bored and had nothing else to do. Following famous makeup artists and beauty bloggers on Instagram and Youtube really motivated me to blog about it and pursue it as a career more seriously. I was very close to graduating from my second Masters in Information Systems technology and I knew that I could do something HUGE combining these two industries together! Marta: Where do you get inspiration when it comes to beauty and fashion and how do you like to inspire others? Beta: My inspiration comes from colors in nature and looking at beauty Instagram posts from other makeup artists and beauty bloggers. I love watching Youtube beauty videos and even tried to create a few of my own. I’m still working on HD filming and editing techniques. Every time I watch a new video I always learn something new. That’s why I love this industry so much. There is so much creativity in it and something new to learn all the time! I’m always experimenting with new techniques every day and try to step out of my comfort zone once in a while and come up with radical new looks! I love playing around with different colored wigs, colored contacts, false lashes and glitter to add dramatic affects to my creative looks! I love inspiring others through my creativity and blog posts on social media. I love the whole transformation and process of makeup from beginning to end and seeing how it can give confidence to women, empower them to look and feel better about themselves and believe that they can be and do anything they want! I have always dreamt of doing something as a career to help change lives and impact people in a positive way. I am thrilled that I finally found it through makeup and upcoming projects combining makeup and technology. Marta: You're quite savvy when it comes to social media marketing. How has that helped you as a pro makeup artist? Beta: Thank you! Social media changed my life and career to a whole new level! I have grown so much personally and professionally because of it and it’s all thanks to Instagram and other platforms where pro artists have shared their #MOTD (makeup of the day) looks. If it wasn’t for daily posts from these pros, I would never have learned about the new shadow palettes, lipsticks, new techniques and tools in creating well defined brows or glitter eye makeup cut creases, etc. Their links to their YouTube videos are the best! I always try to watch a few videos a couple of times a week and practice it on myself. I absolutely love it and feel so blessed to have social media as a tool and platform, not just to learn from others, but also to teach, share and inspire others with my makeup artistry too. Marta: What's your favorite makeup look to do on your clients? Beta: The one that makes them feel the most beautiful and comfortable. I think makeup should be customized to individual tastes and personal style. Nothing is worse than having a dissatisfied client in this industry. It’s like getting a terrible haircut at a salon because the stylist failed to understand their client’s needs. I always ask questions and try to get as much information I can about my client’s personal tastes, lifestyle and skin concerns before I sit them in my chair. Depending on how open they are to my creativity, I love transforming them to a better version of themselves and I always encourage them to get out of their comfort zones and try something new and different. Nine times out of ten they love it, and if they don’t feel comfortable with a new look, either we go back to their comfort zone or I make sure to let them know that I always have their best interest at heart and never force them to go for any look that I didn’t think looked amazing on them. Marta: What beauty tips would you give to the woman on the go? Beta: I would say always keep your lips and face moisturized, and never leave the house without at least a BB cream and a little concealer under the eyes. It doesn’t take much to look polished and presentable. Whenever I am in a hurry I always make sure I have curled lashes and a lipstick with a BB cream and concealer at the very least before I step out of the house. It takes less than 5 minutes and I’m sure every woman has 5 minutes to spare in the mornings, right? Marta: What projects are you currently working on? Beta: I’ve recently been approached to manage the beauty section of Emerge The Magazine so I am working on my first beauty blog and writing up pieces for that. I am also presenting Beauty tips and makeovers at M.A.G.I.C DC, which stands for Metro Area Gender Identity Connection of Washington DC. In the face of LGBT awareness and acceptance issues in the US, I thought it would be awesome to help that community with makeup applications. I cannot imagine how hard it already is for them to make their transitions, so for me to show them self-love and self-acceptance through makeup is like a dream come true. To be able to make their trans-journeys more fun and exciting is the very reason why I do what I do and love what I do on a daily basis. If I can help someone on a profound level with makeup then I have accomplished my purpose as a human being. Copa: Where do you see yourself in your five year plan as a pro artist? Beta: I see myself continuing to help and transform people through makeup, probably traveling locally and internationally, giving talks and seminars on makeup and how it can help change lives. I see my Glam’N’Go business thriving with exciting new projects and collaborations! I may even come up with a new technology project that can help enhance the beauty community’s experiences and love for learning, sharing, growing and creativity of makeup.